6½ (7¼, 8¼)" (16.5 [18.5, 21] cm) foot circumference and 7¾ (9, 9¾)" (19.5 [23, 25] cm) long from back of heel to tip of toe; foot length is adjustable. 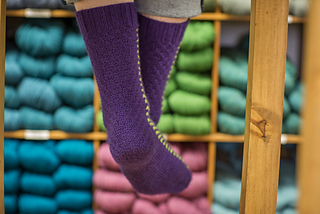 Socks shown measure 7¼" (18.5 cm). This pattern is available from interweave.com for $11.99. 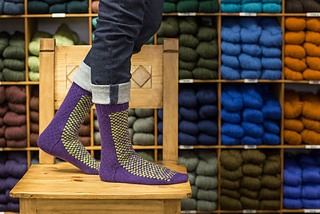 Mone cleverly combines stranded colorwork and textured stitches in these top-down socks. Some assembly required, but the results are worth it. Knit these up in a variety of colorways for men or women. FINISHED SIZE 6½ (7¼, 8¼)“ (16.5 [18.5, 21] cm) foot circumference and 7¾ (9, 9¾)” (19.5 [23, 25] cm) long from back of heel to tip of toe; foot length is adjustable. 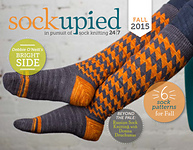 Socks shown measure 7¼“ (18.5 cm). YARN Cascade Yarns Heritage (75% superwash merino wool, 25% nylon; 437 yd [400 m]/3½ oz [100 g]): #5633 Italian plum (MC) and #5659 primavera (CC), 1 skein each. NEEDLES U.S. size 1½ (2.5 mm). Adjust needle size if necessary to obtain the correct gauge. NOTIONS Markers (m); stitch holder; crochet hook (if desired to pick up stitches); tapestry needle. GAUGE 32 sts and 44 rows = 4” (10 cm) in St st; 38 sts and 42 rows = 4” (10 cm) in colorwork patt.